With the temperatures dropping and there still being plenty of winter vegetables in the ground or in storage a great way to keep warm and eat them up is by making a winter vegetable soup. This simple and handy recipe is easy to make and very filling. 1. Make the chicken (or vegetable) stock either using stock cubes (follow packet instructions for how many cubes to make 2.5 pints) or your own prepared stock. Use a medium sized-pan. Add the pearl barley and simmer the mixture whilst continuing on with the steps below. 2. Heat the oil and butter in a large saucepan. Add the onion and leeks and cook, stirring, over a medium heat, for 4-5 minutes until soft. 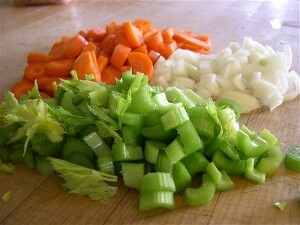 Add the wine now along with the parsnips, celery, carrots and potato and cook, stirring, for 2-3 minutes. 3. Pour your stock into the saucepan with the vegetables and bring to the boil, adding the tomato puree and bay leaves to complete the soup. then simmer for 20 to 25 minutes until all the vegetables are tender. 4. Season with salt, pepper and nutmeg, then stir in the parsley an thyme. 5. Transfer to warmed bowls. Serve with your bread. I like this soup in the winter! It's creamy and rich without the fat and I'm not generally a fan of sweet foods.